Archaeologists in Israel have uncovered the partial jawbone from what appears to be a modern human. Dated to between 175,000 to 200,000 years old, the fossil is 50,000 years older than any other human fossil found in the region, suggesting humans left Africa far earlier than previously thought. The fossil was found in Israel’s Misilya Cave, one of several prehistoric cave sites on Mount Carmel. Archaeologists have been exploring these caves for decades, so the discovery of the odd bone or artifact isn’t particularly extraordinary; ancient humans, including now-extinct species and anatomically modern Homo sapiens, populated these caves repeatedly during both the Upper and Lower Paleolithic, leaving signs of their occupancy behind. The recent discovery of a partial jawbone with several teeth still intact didn’t seem like a huge deal at first, but when multiple dating techniques put its age at between 175,000 to 200,000 years old, the archaeologists who found the fossil realized they had stumbled upon something special. As the ensuing study published today in Science shows, the new fossil resets the date for when modern humans (Homo sapiens) first left Africa, leaving their continent of origin for the Middle East. Prior to the Misliya discovery, traces of the earliest modern humans to have left Africa were found at the Levantine sites of Skhul and Qafzeh, which were dated to between 90,000 and 120,000 years ago. Genetic analyses of other human remains hinted at an even earlier exit date, but tangible, archaeological evidence was lacking. The jawbone, dubbed Misliya-1, is now providing that crucial bit of evidence. Indeed, by the time Homo sapiens ventured out of Africa, other humans (now extinct) had already taken root in the Middle East, Europe, and parts of Asia. Neanderthals made Europe their home as far back as 500,000 years ago, while Homo erectus settled into the Middle East around the same time. Our species was late to the show—but Homo sapiens eventually prevailed, going on to settle virtually every corner of the planet. Israel Hershkovitz, the Tel Aviv University archaeologist who led the research, said a key challenge of the study was to present evidence that proved the fossil belonged to a modern human, and not a Neanderthal or archaic human. 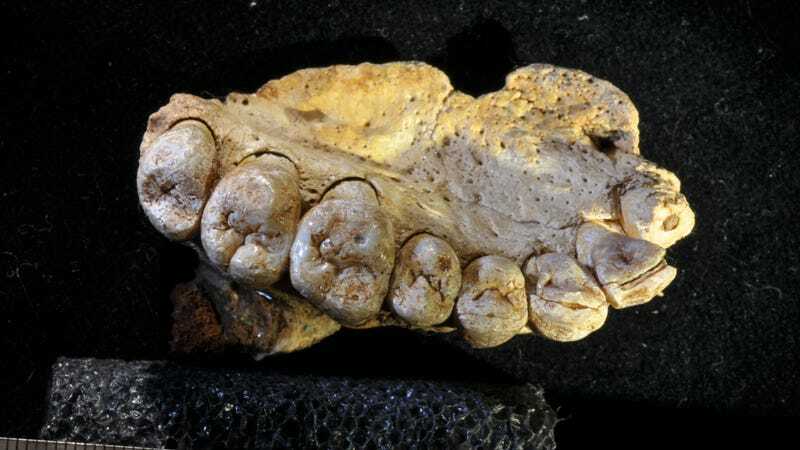 The scientists didn’t have a lot to work with—some bone surrounding the tooth sockets, a bit of cheekbone, part of the nasal cavity, the roof of the mouth, some teeth in the upper left dentition—but it was enough. After careful analysis, it was shown that the fossil bore virtually no resemblance to other types of humans, exhibiting an anatomy consistent with Homo sapiens, including the size of the teeth (Neanderthals, for example, had a tooth crown that was low and broad). MicroCT scans and virtual 3D models were used to compare the fossil to other hominid fossils from Africa, Europe, and Asia. The researchers also took great pains to date the fossil, using three independent methods. In addition to the partial jawbone, the archaeologists also found traces of fire use and some tools within the same stratigraphic layer—including a stone cut with the Levallois technique. These humans, the study suggests, were sophisticated tool makers and competent hunters, capable of taking down large game and processing animal carcasses. The Levallois tools are the oldest in the region to be linked with modern human activity. Previously, these high-tech tools were also found at the nearby Tabun Cave, and dated to between 190,000 to 260,000 years ago; the authors say this suggests modern humans were in the region even earlier than the new fossil suggests. Katerina Harvati, Head of Paleoanthropology at the Senckenberg Center for Human Evolution and Paleoenvironment, is impressed with the new study, saying the authors presented “an extremely thorough analysis of the anatomy of this fossil.” She said the jawbone was “remarkable” in that it exhibited no features typical of Neanderthals or other archaic humans, but is instead similar to modern humans. Eric Delson, a paleoanthropologist at Lehman College and researcher at NYC’s American Museum of Natural History, also likes the study, saying it’s an exciting new find of “probable members of our own species” outside Africa, and earlier than any other well-accepted finding. What’s more, the recent revelation that modern humans were hanging out 300,000 years ago in what is now Morocco hints at even earlier migrations. As for matching the tools to the jawbone, Delson is less impressed. “The authors suggest that the tools found with the fossil indicate that Homo sapiens must have been present earlier in time, but I do not agree with this,” he told Gizmodo. Archaeologists have long known about similar tools dated to between 150,000 to 60,000 years ago (and possibly even much older) that have been associated with both Neanderthals and early Homo sapiens in the Near East. In addition to establishing a new historical timeline for human migration out of Africa, the new study is also telling us something about ourselves. Did Scientists Just Discover the Last Common Ancestor of All Apes?